Products are one piece of the jigsaw puzzle that is bringing a successful spa together. Products in the spa can be boiled down to fit into one of two classifications: those that are used in treatments and those that are sold as retail. They may be the same. There are a lot of variables to consider when deciding on the products you will use for services and as retail goods. “To decide on the product that will be used, we need to have decided on what market the spa will approach and what exactly that market can handle,” says Sandra Moren, a spa consultant and professional speaker with Kyron Spa and Salon Consulting. Having developed a business plan already, which would include an in-depth look at your target market, deciding the price range of products that you will consider should be a breeze. Is your spa going to be affordable, mid-level or high-end? Knowing this, get online and do some research. There are literally hundreds of product manufacturers out there vying for the attention of spa owners and most of them have websites detailing benefits, ingredients, uses and prices of their products. In addition to manufacturer websites, search for online product reviews, blogs and magazines. These can provide valuable information that would otherwise be unavailable. Often you can find consumer/spa client reviews of products online as well. If working with a spa consultant, they will be able to provide further assistance toward which manufacturers you should hone in on. “The product not only needs to fit with your market, but also with your image,” says Barbara Crowhurst, a retail business consultant and President of Retailmakeover. For example, you may be trying to create a small-town feel within your spa. Don’t compromise this by offering product lines that exude a big-city feel. “The spa owner really needs to take into consideration the theme of the spa and the vision they have had from the beginning,” adds Moren. Take into consideration the support that you will get from a product manufacturer. The price of a bulk product purchase is important, but the additional services offered by manufacturers can add real value. “What kind of education does the manufacturer offer? Does the manufacturer come in when the spa has a grand opening or an open house? Will the trainer commit real time to your staff?” asks Moren. Recently, a spa that Moren was working with in Alberta sourced a product out of Quebec because of an appealing price. “The only problem was, the product didn’t have a rep west of Montreal,” she says. While the price was good, the potential added value was nonexistent. When choosing your products, take into account the amount of time they have been available to other spas and consumers. Certain products, such as nail polish removers and massage oils, aren’t replaced by new lines as regularly as products such as nail polishes or gels, which are subject to seasonal colour changes. Make sure your products are new and appropriate. “Clients are always interested in new product lines,” says Moren. Looking through products can be exciting, but it is important to avoid getting too excited about offering too many product lines for your services. According to Moren, it is best to start with one skincare line. This way, you can avoid tying up excessive amounts of startup money in product, and ensure staff is fully educated in the products they are using. “If you have too many lines, the staff won’t be comfortable with it. Staff needs to be properly educated on the benefits of a product, application or uses and so on. With too much product, staff can get confused,” says Moren. A few months down the road, add a second skincare line, but that should be the maximum, Moren believes. When it comes to makeup, a spa should carry one line. Seasonal colours, especially in Canada, are ever-changing. Variety should be available to clients through the seasonal colours that your selected manufacturer releases, rather than through an over-saturation of brands. This goes for nail polishes and gels as well. It is wise to retail the same products you use in your spa services, allowing clients to maintain results between visits to the spa. This is another reason estheticians need to be educated on the products that they use during treatments—they also perform the function of salespeople. If a client is aware of the benefits of a particular product, they more are likely to buy that product for personal use between visits than if they had no information about it. The design of the retail area will influence client purchasing as well. “If the retail area is designed correctly, it will generate a phenomenal amount of money,” says Moren. “Customers need to be around retail items, but not enveloped by them,” adds Crowhurst. 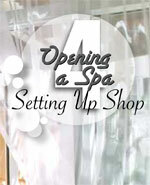 In a spa, there are two options for setting up a retail area. If you have the space, teaser items can be displayed in the reception area (in moderation), which will serve to draw clients’ attention to the larger, separate retail area. If there isn’t enough space for a wholly dedicated retail room, let the reception area host your product. Don’t be afraid to set up tables in the retail area. According to Crowhurst, the key selling height for product is from knee to eye level. When setting up your shelving or tables, keep this in mind. The retail fixtures you settle on should also reflect the spa’s image. Don’t use rustic-looking wooden shelving if the spa is meant to be ultra-modern and don’t create clutter by rolling in multiple display armoires. Avoid tying up too much money in the retail area as well. Covering the walls in floor to ceiling shelving and filling those shelves with product is not only unsightly, but also impractical. Product should be placed in a laser line alignment, meaning one product at the front of the display and all of the stock in a line behind it. Pay careful attention to the lighting of the retail area. She suggests halogen tracks be installed three feet in front of a display to achieve the maximum benefit of the lighting. The spa’s retail offerings can also extend beyond lotions and potions. Consider offering robes and towels. Items related to impulse buying, such as candles, oil diffusers or music should be stocked and displayed near the cash. These can be purchased through wholesalers at a discount depending on order size. Setting up shop requires more than product selection. A spa needs massage tables, hydrotherapy tables and fixtures, robes, manicure and pedicure stations, cash registers, debit machines, and more. Searching for equipment manufacturers can be done in the same way as searching for product manufacturers. The Internet is a valuable tool for entrepreneurs. Search for companies that are established. A company that has been around for a while has the stability that a new spa owner needs, and will offer support when you are faced with any equipment-related challenges. Once you find a few manufacturers that are to your liking, you can take a slightly different approach than with the products. For example, one company may have a higher price, but is offering a better overall discount. Freight is also a cost that must be taken into consideration when buying equipment. Will the company share or even cover the cost of freight? Getting the manufacturer to cover freight can be a huge victory for a spa owner. Consider the proximity of the manufacturer or supplier to your spa as well. Just like with products, having access to equipment trainers and specialists is important. There are also comfort items such as robes, towels and sheets. These can be purchased from everyday retail stores, but can also be sourced through specialty manufacturers that can personalize the product with writing or art. Uniformity is an important thing to keep in mind when looking at comfort items. You don’t want leopard print towels, dark green robes and prison striped sheets, unless of course that somehow fits with the spa’s image. “Be sure not to over-invest in these items as well. The number you buy should be derived directly from the volume of clientele you’re expecting to have,” says Moren. In addition to this, how do you plan to deal with laundry in the spa? Will you wash linens on-site or send them off at the end of the day? Look into any discounts that retailers may offer to businesses on washing machines and dryers. Contacting specialty suppliers, such as those offering massage tables or pedicure stations, is as easy as sending an email or picking up the phone. Face-to-face opportunities are abundant at trade shows, so consider spending a little money to travel to the big ones. It could pay off in discounted rates and a personal relationship with your equipment supplier. As with real estate, setting up shop in your spa requires much research. Finding the best deals on products, equipment and other peripherals may take time, but it will be worth it in the end. “When you’re putting a spa together, it’s like a big jigsaw puzzle. You need to identify all of the pieces—once you’ve done that, everything comes together much more readily,” Moren says. What About my Own Product Line? Launching a private product label in conjunction with the opening of your spa is not always a good idea. Opening a spa is enough work on its own, and adding the workload associated with a private line will only make things more hectic. “I’d recommend spa owners start with an established product line and see how that goes for a year. Once the business becomes profitable, then you can think about the private line,” explains Sandra Moren, a spa consultant and professional speaker with Kyron Spa and Salon Consulting. That year will allow you to get a feel for the industry and make an educated decision on whether the added workload will be worth the potential monetary return. *To read more about launching a private label, turn to page 16 of the Spirng 2010 Issue.